These past few weeks have been ones of reflection. Having photographed the regions I initially outlined for my project, I’ve been bumming around, trying to find another story to pick up, reading Isaac Asimov’s “Foundation” series, and thinking. Moving some too. After Rajasthan, I continued north to Amritsar, holing up for two days with a fever, visiting the Golden Temple, and then, finally, trucking on to Jammu. I recuperated further and then took an amazing Jeep ride to Srinigar, the capital of Kashmir. There I tried to launch another story comparing Kashmir and Ladakh, and how occupation in the 21st century by the Indian security forces affects the people’s daily lives. Snow in the pass killed the idea so, after a week based in a houseboat, I journeyed on to McLeod Ganj, location of the Tibetan government-in-exile. Many stories, of course, and many experiences to share. One, from a few days back, had me drop everything to write it in my journal. On the bank of the sacred Dal Lake, there is an chai and omlette stand. Well… not quite on the bank but on a road leading off the main and so close I can justify calling it the banks. I drop down to the basin after hiking some kilometers from McLeod Ganj. Having had no lunch, I spot the modest carton of eggs casually on the small sill and amble over. “Yes,” he says, pointing to the eggs and a loaf of cheap white bread. Wow, a steal I think, and readily agree to the deal. As he cooks, I become lost in my thoughts, hastily scribbling down ideas which came to me during my walk. One page filled, I move on to the next. I am in lala land often, daydreaming about this and that, and what I might do in the near future. Impervious to the outside world, and distracted by a vivid desire to create concepts. Many people are, I believe, but I won’t personally draw judgement as to whether it is good or bad. It just is. Yesterday, I met a man named Klaus at my “Tibetan cooking course.” An astrologer from Denmark, he seemed quite normal with his feet on the ground. For me, he became a person of interest, someone who occupied a number of brain cycles, because he had just finished a ten day mediation course. Conducted in complete silence. No talking, no conversation, just listening to your thoughts for hours on end. If you ask me, it sounds like a gnarly way to discover yourself. I would go insane after day two. And yet, shortly after our exchange about his experience, he pulls out a cell phone to see if he has any messages from family back home. The same addiction I left the States with. I think we only try to escape it, and can never succeed. The omlette is ready. The chai man brings it out to me, I’m sitting on a simple wood bench, the type which would break if your weight is too much, and I’m struck by how generous of a portion it is. On a simple white plastic plate, the kind from my childhood, the omlette takes up so much space that the two small, square pieces of toast have to be piled on top. I cut the egg into two pieces, divy up my toast, and dig in. The meal is delish. I’ve been getting more and more of this recently. It might be my stubble of a beard, but I can’t be sure. “No, United States,” I reply. The chai man looks at me confused, obviously not understanding. “Amerika,” I add, emphasizing the “k” which seems to me the trick at the beginning of anyconversation. It’s been my goal for the last few weeks to cut back to one cup a day. If I drink too much, I only sleep five or six hours each night and wake up at four AM. With my mind racing about where I’m going to go, what I’m going to photograph, and which emails I’m going to send, it’s nearly impossible to get back to sleep. Plus, it’s bad news for whomever has to be the recipient of those emails. But heck, I’ve fallen in love with this guy’s stand so I think why not. “Yes, one cup,” I say, and see him move his pan off one single burner to make way for the pot. 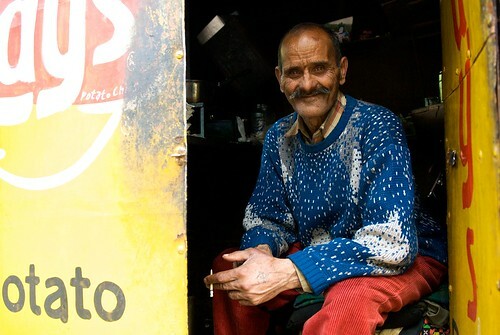 The man’s business is the quintessential Indian chai/omlette/samosa shack. I can’t put it any better than that, as the beauty of the moment struck me like a lorry. It’s painted bright yellow, similar to an STD point, and the side is emblazoned with “Lay’s Potato Chips.” There is a sill in the front at chest height with forty or so eggs, that loaf of bread with flies buzzing around it, several samosas in a pan, and a small bottle of red-ish, ketchup-y sauce for whatever you’d like to put it on. Sure, the stands come in many shapes and sizes on the sub-continent, with different types of foods, drinks, plates, and cups, but at this moment I notice it in its entirety. To me, the stand is a profound statement of my travels. This is India, and this man sells omlettes and chai for a living. As he’s heating the chai, I suddenly want to capture the process. I whip my camera out of the bag, spilling another set of notes in the process. As I peer through the viewfinder, though, I see I’ve been inspired at the end of his work. He pours the drink through a strainer to my cup. The chai is ready. I repeat the question back at him, not understanding its nature. Whatever connection we made when I first arrived at his humble stand is magnified, enhanced. He gives me a “yes” with a broad smile and proceeds to show me a picture, worn and weathered, of him on the bank of Dal Lake. He is standing in front of a sign, and looks quite proud in a blue and red vest. I look closer and can see he’s pointing at script on the sign. Ah, that makes sense. It says “Dal Lake” in Hindi. Ah, his name. That make sense too. “I’m Daniel,” I forward while holding out my hand. He has one last tattoo to show me, the holy Om on the back of his hand. I don’t recognize it at first, but then I do. I pull out my Om, the one Kip brought back two years ago, from under my shirt and show it to him. “Shiva,” he says, pointing at my neck. And that’s the magic. That’s who he is, or a part, and that’s who I am. Or a part. Our conversation is limited because of language, but we’re both eager to learn about one another. India, although rapidly “modernizing,” is still about people. It affects me, irrovorcably I hope, every day I’m in this country. Having finished my chai, I pay the six rupees and wander on.